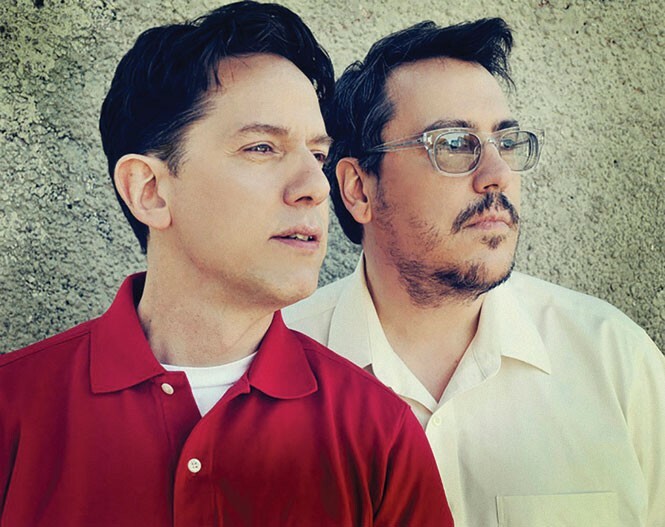 In 1983, long before They Might Be Giants blossomed into a beloved indie-pop institution, their nascent career was briefly derailed—after only their third show—by twin misfortunes: Guitarist John Flansburgh lost his equipment when his apartment was burglarized and keyboardist/accordionist John Linnell broke his wrist in a bicycle accident. Forced to take a break from public performances, the two Johns kept up their creative energies by recording new material and releasing it through Flansburgh's answering machine. They placed an ad with Flansburgh's phone number in the Village Voice, coaxing diehard fans and curious Voice readers to call up for a direct line to soon-to-be standards and fresh-from-demo cuts. They called the service Dial-a-Song. And, Flansburgh says, it made They Might Be Giants who they are—not only in terms of the attention Dial-a-Song brought the band, but in more abstract ways, too. "The one thing that I'll be forever grateful for is that the original Dial-a-Song just introduced the band to so many people in such a singular way," Flansburgh says. "As much as bands try to sort of set themselves apart from the crowd, it's very difficult to give people a different experience. A lot of the ways people are introduced to bands are very standardized, and the great thing about the Dial-a-Song thing was that it was so different. It really put the songs first. It really just changed us. It really focused us on what we could do that was our own unique 'us.' "
Dial-a-Song waxed and waned over the years, depending on the band's own creative course and various technological advances, but over the lifespan of the phone number (and the DialASong.com website, which first went online in 2000), it's estimated that more than 500 distinct songs were recorded, giving the band one of the largest recorded catalogs of its generation. Dial-a-Song was mothballed in 2006, but late in 2014, the Johns revived it—but without the original true-Brooklyn 718 area code. Instead, it has been replaced by a toll-free 844 number. "When it started, it didn't have the 718 area code anyway, because all New York area codes were the same," Flansburgh chuckles. "When they invented the 718 area code, I was afraid that Dial-a-Song would be kind of ruined, because we would be exposed as kind of non-New York City residents. There was such an expansion-team feeling about the 718 area code." Thirty years later, Dial-a-Song—which anticipated (by two decades) the rise of every web-based method of making rough song sketches available to the masses—operates something like a podcast. Flansburgh and Linnell post a song a week, and not only via the resurrected phone line. The Dial-a-Song website has been reupholstered; a YouTube page is constantly refreshed; an e-mail subscription delivers album-quality downloads into inboxes each week; and the Dial-a-Song Radio Network reaches more than 125 terrestrial radio stations. "The thing that's really coming across is that by being in people's lives on a weekly basis like this, people really are experiencing this project with us," Flansburgh says. "And so they have an equity in the band in a way that's really different than just hearing that a band's put an album out and consuming it." It's not exactly the same project that the original Dial-a-Song was, Flansburgh concedes, but he contends the peg for its audience has shifted from the novelty of hearing a song on the phone to hearing a new song each week. And that has rejuvenated They Might Be Giants, which, after more than three decades, got ground down by the typical record/release/tour rigmarole and listeners' limited-attention spans. "It's a little bit frustrating to not have people really take in full albums these days, so we're just backward-engineering our output to get a little bit more hang time with listeners," Flansburgh says. "So far, it's been a pretty glorious result. We're back in people's lives in an ongoing way, and that's really exciting for us. It's an exciting thing to be doing, and ... our energy has really been buoyed by the public response. People seem psyched, and that, in turn, has made it easy for us to redouble our efforts in making it great." The returns from Dial-a-Song reinforce that notion. Glean, released April 21, collects most of the output of the first weeks of the 2015 Dial-a-Song project, and the songs are as sharp as they are varied. The string-and-horn-driven new wave of "Music Jail, Parts 1 & 2" abut the herky-jerk pop of "Erase." The tongue-in-cheek disco of "I Can Help the Next in Line," inspired by customer-service patter, sits against the dark and absurd "Answer." The self-referential "No Cops" (one of the singles that was released in 2015 but not included on the album) offsets the self-deprecating "I Am a Coward." "Hate the Villanelle" rails against the rigid poetic form—while also being a perfect example of one. Like everything else in the band's world, the songs are reliably—and often brilliantly—off-kilter. And, in a nod to the purists, call Dial-a-Song old-school style, and you'll hear the music in all its hissy, lo-fi glory—just like in 1983. "It's not much better now, actually," Flansburgh laughs. "One of the nice things about bringing [Dial-a-Song] back is that people can experience just how chaotic it really was."